What Should You Know about HEIC and JPG? At present, HEIC is a hot topic especially in Apple circle. It has drawn much attention from both iOS 11 users and non-iOS users. What is certain is that when you see this new word first time, you are puzzled about what HEIC is as well as what differences between HEIC and JPG. It is not strange that you are familiar with JPG, but do you know why Apple released HEIC, a special image format, to replace JPG? Here we will make a deep comparison between HEIC and JPG. The reason why JPG has become the most popular image format is that it is compatible with all operating system, including iOS, Android, Windows, Mac and Unix. While HEIC images can only be opened on the devices, iOS 11 and macOS High Sierra (10.13). To some degree, it is not convenient for users to transfer these HEIC images to Windows system, Android devices, older macOS system and any other devices. If you are an iPhone user, you must be clear about the camera settings, which includes two different options, these are, "High efficiency" and "Most Compatible". Here, "High efficiency" stands for HEIC while "Most Compatible" stands for JPG. The images taken and saved with HEIC format take up less storage space than JPG file format. When it comes to this point, you may have doubt that are the HEIC images saved with damaging original quality? Don't worry about it. This is where its charm lies. HEIC images are smaller and better than JPG with only half size of it. To preserve the images' details, HEIC format compresses file sizes more efficiently than other compression algorithms such as JPEG. HEIC format can support multiple images in one file, not only for single photo, but also for live photos, a sequence of animations and even burst-photo shots, meaning it will become a potential alternative of GIF. 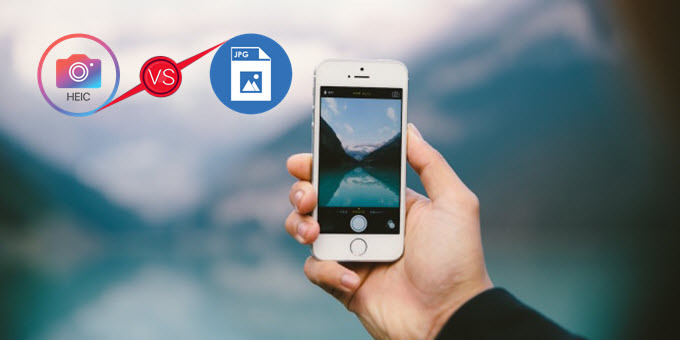 Comparing with it, JPG can only cover one image in a file, which means that you need to keep a number of pictures in your phones and it will accordingly cost too much time to transfer such thousand of files to others or to other devices. What need to be mentioned is that HEIC images can keep EXIF information for a photo made with a typical digital camera, which is actually a JPEG file to comply with the JPEG standard, but added to the heading information about the contents of the shooting information and index maps, including Manufacturer, Model, Orientation (rotation), Date and time, Exposure bias, FlashPix version and so on. Referring to the transparency, HEIC can support its image color up to 16 bits but JPEG's measly 8-bit color. That is to say, HEIC images can provide a wider color gamut. Taking a picture shown on a display that is able to cover a big gamut as an example, you will see richer color and more dynamic scenes with less banding in a HEIC image while JPG is not as well as HEIC. Moreover, HEIC is also suitable for editing. By rotating and cropping HEIC image, it will not be altered and resaved, which easy for you to undo no matter what you have done at any time in the future. To make previewing and space-saving faster, HEIC image can also support multi-resolution representation of the same file (such as, multiple exposures or stereo 3D images). There is no doubt that we live in a world, which belongs to JPG. As the most compatible image format, JPG is the first choice for nearly all people from which they can get a sense of reliability. To keep abreast of the times, though Apple has designed HEIC format, at the same time, it has developed different ways to deal with a situation where people need to view their HEIC images on other non-iOS 11 devices or transfer them to other application that cannot support HEIC. For example, when you attach your HEIC images to a new email and send it to other email account, HEIC images will be converted to JPG automatically. You will pay attention to the benefit, like occupying less space and keeping good quality. In future, if all of us replace JPG with HEIC, then the whole network will accelerate and avoid the situation, like some webpage cannot be opened. What has been put on the top priority is that we need to solve the big problem of HEIC, that is, the compatibility. Otherwise, it will let people get into trouble when take this new image format as their preferred one. To be frank, no matter how bigger storage size HEIC can provide, if it cannot facilitate people's digital life, JPG will still be listed on the top rank. Now, I guess you have a clear concept for both HEIC and JPG. If not, the following table can be provided for your reference. If you are a reader who is using iOS 11 operating system and have difficulty in viewing your HEIC images on other non- iOS 11 devices, you are supposed to know how to convert HEIC to JPG without scarifying image's quality. Here we recommend an all-in-one and multifunctional converter, Joyoshare HEIC Converter, from which you can get a big surprise and solve your problem easily. To find out how it performs in converting HEIC photos to JPG, please visit this post: How to Easily Convert HEIC to JPG with Lossless Quality. Hope you a good experience!